2 things.. the Ultimate red sneak. Nike have dropped the high premium SB dunk high sneaker and what a packet it is! Inspired by the customary Chinese red packet – a red envelope containing “lucky money” – these shoes come dyed in a gorgeous crimson with gold accents. According to Chinese custom, the color red symbolizes good luck and is supposed to ward off evil spirits, while gold symbolizes wealth and happiness. This is shaped to be a class winner for all you trainer fans out there! 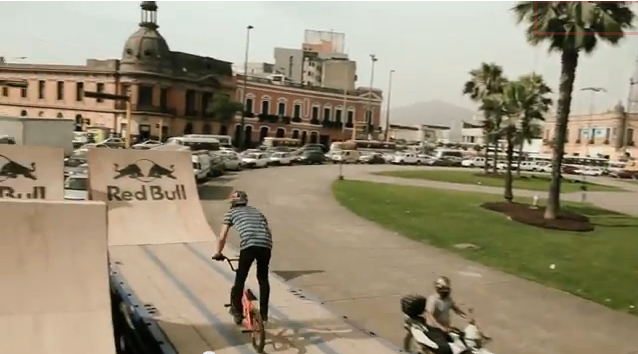 Red Bull and Daniel Dhers take to the streets of Peru in this next level demonstration of pure BMX badassness! The Venezuelan five-time X-Games Gold Medalist demonstrates both his skill and lack of fear as he performs what he does best on two specially-designed ramps mounted on moving trailers alongside Lima’s chaotic traffic. Its no wonder why Red Bull have some of the dopest BMXers onboard with them..afterall they get to do things like this for a living! Are these photographs?.. think so?.. think wrong! Look further into it and Zaria Forman has produced one of the wonders of the art world with her pastel drawings of icebergs and arctic scenes! Just look how detailed and precise these pastel drawings are and let them take you away to another dimension! Too dapper for words!